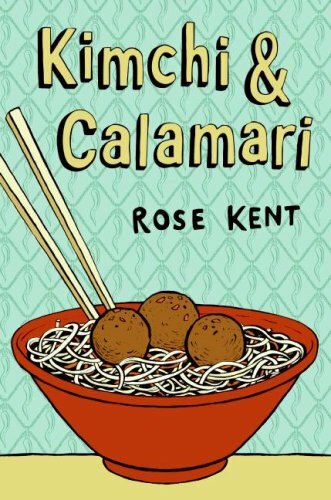 Earlier this year, there was some nice blog buzz about a book by Rose Kent, Kimchi & Calamari. It looked interesting, but it took my library months to order it and then another couple of months for me to remember that I had wanted to read it. Ah, what can I say? You wake up and you’re fourteen. The world is your supersized soda waiting to be guzzled, right? Wrong. My birthday tasted more like Coke that went flat. I love that image. Joseph Calderaro was ready for a great birthday, but it turns out that his class is assigned an essay on their ancestors. This assignment is tricky for Joseph, as he is of Korean heritage but adopted by Italian parents. His birthday dinner brings up the same issue when his father gives him a gift that is given to Italian sons. Joseph tries to be gracious, but ends up insulting his father. Then when a Korean family moves into the neighborhood, he finds himself even more torn and conflicted about his heritage and family. While it’s a book about being caught between cultures and expectations, it’s also a story about being a teenage boy. The writing is strong, with humor and sensitivity. The author uses the experiences of her own family to bring a realistic and personal feeling to the story. A coworker of mine shared that she found it very true to her experience as an adoptive parent, and I’ve seen that sentiment echoed elsewhere. For more on the book, author, and adoption, check out this through review at Jen Robinson’s Book Page, this interview at A Year of Reading, and this note from the author herself about National Adoption Month at Fuse#8. Thanks for linking to my review. I liked that first paragraph, too. And it's very true to the rest of the book.